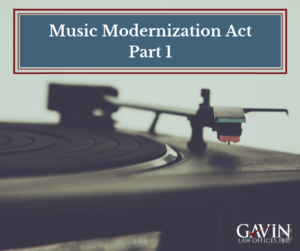 The Music Modernization Act, which streamlines the music licensing process to make it easier for rights holders to get paid when their music is streamed online. The CLASSICS Act (Compensating Legacy Artists for their Songs, Service, & Important Contributions to Society Act) for pre-1972 recordings. The AMP Act (or Allocation for Music Producers Act), which improves royalty payouts for producers and engineers from SoundExchange when their recordings are used on satellite and online radio. Notably, this is the first time producers have ever been mentioned in copyright law. The central focus of Title I is that it changes the way in which “qualified digital music providers”—iTunes, Spotify, etc—pay royalties to songwriters and their music publishers for reproduction and distribution of their musical work. As it currently stands, Section 115 of the Copyright Act has established a process in which one can obtain an automatic right to reproduce and distribute another’s previously recorded musical composition—this right is known as a “compulsory license.” To obtain a compulsory license, the service merely has to provide notice to the copyright owner (or the Copyright Office if the copyright owner cannot be located) of the composition and agree to pay a statutory rate set by the Copyright Royalty Board (CRB). The MMA aims to make this process easier by creating a centralized “Mechanical Licensing Collective” (the “Collective”). Instead of notices and payments going to the Copyright Office, the Collective will manage all notices and collect and distribute royalty payment when a provider fails to locate a copyright owner. The Collective will also establish a process for dealing with unclaimed royalty payments and maintain a working database of eligible works. Of particular note, the Collective will allow digital music providers to pay for a “blanket license” that would cover the use of all works in the database. Finally, and perhaps most significantly to songwriters, the MMA will modify the standard used by the CRB when determining rates to be paid for licenses and it is looking likely that this will result in increased royalty payments for songwriters. Gavin Law Offices, which handles intellectual property matters for clients, earlier this month opened an outpost in Raleigh, North Carolina, after picking up attorney Alan Etkin. It’s the firm’s first office outside of Virginia. Founder Pam Gavin said the expansion is similar to its January push into Charlottesville when longtime solo attorney Elva Mason Holland joined the fold. “This is very much a similar story,” Gavin said of Etkin. Etkin, who earned his law degree from Emory University, handles a variety of business law issues for closely held corporations. Gavin also liked the idea of having an office in Raleigh to tap into that area’s concentration of tech firms and startups, a ripe environment for the firm’s bread-and-butter IP practice. “It’s a great market for tech and intellectual property,” she said. The firm, founded about 15 years ago after Gavin’s stints at McGuireWoods and Reed Smith, now has an attorney headcount of seven. Gavin said she’ll keep her eye out for future growth through similar deals with attorneys. A Richmond law firm that boasts clients in the entertainment industry has expanded its practice westward. Gavin Law Office, which was founded locally in 2002, last month opened an office in Charlottesville. The expansion was prompted by the addition of Elva Mason Holland, a Charlottesville attorney who had a longtime solo practice before joining Gavin. Firm founder Pam Gavin said she’s had her eye on Holland for years. Gavin said her firm’s practice and Holland’s book of business fit nicely together. Gavin Law represents musicians and a range of businesses, from startups up to large companies, in intellectual property matters. Holland represents talent in the entertainment business. The new addition brings Gavin’s attorney headcount to six. Its local office is in Henrico County at 2229 Pump Road. Holland has her bachelor’s and law degrees from UVA. Gavin, also a UVA grad, began her career in bank marketing, before going back to law school at William & Mary. She started her own firm in 2004 after stints at McGuireWoods and Reed Smith. Gavin has expanded the firm previously, including by adding a solo practioner in Bedford years back, before that attorney in that office decided to go back out on his own. She said this latest stop in Charlottesville won’t be the firm’s last. The U.S. Copyright Office has developed a new electronic system for registering your designated agent under the Digital Millennium Copyright Act (“DMCA”). As of December 2016, the U.S. Copyright Office has begun transitioning to an online registration system which allows online service providers to register a designated DMCA agent in a centralized public directory. Any new registrations must be completed through this online system. Most importantly, even if a service provider has previously registered its designated DMCA agent with the Copyright Office through the previous paper filing system, the service provider must re-register through the Copyright Office’s new online system before December 31, 2017. Registering and maintaining a designated agent with the Copyright Office for copyright infringement takedown requests is necessary to obtain safe harbor protection under the DMCA. Safe harbor protection can help shelter online service providers from potential copyright liability for any third party content posted on or transmitted via their websites. In order to qualify for safe harbor protection under the DMCA, any online service provider that has a website or application which allows users to post, share, transmit, or comment on content must designate a Copyright agent. To designate an agent, an online service provider must not only provide the contact information for the agent to the Copyright Office as part of its online public directory, but also make the contact information for the agent available to the public on the online service provider’s website so that users can notify the service provider of allegedly infringing material. On the Copyright Office’s online registration system, online service providers must create an account and provide all necessary information regarding the service provider itself, the designated agent, and the associated websites. Registration costs $6 per online service provider submission. While the registration forms seem relatively simple, they raise additional issues that need to be considered carefully. For example, related companies that are separate legal entities (parents, subsidiaries, etc.) and own related but separate websites must register separately. An online service provider must also provide all alternate names under which the service provider is doing business, such as any of its associated website names and/or domains, software application names, or any other commonly used name that the public would be likely to use to search for the service provider’s designated agent. In many cases a website owner can submit multiple websites/alternate names in one submission, but it depends on the specific circumstances. The DMCA must be strictly complied with in order to receive full safe harbor protection, so it is essential that the registration forms are properly and fully completed. Once the DMCA agent has been designated through the Copyright Office’s online system, online service providers must ensure that all of the registered information remains up to date. Any failure to maintain accuracy in this information could result in losing the protection of the DMCA safe harbor provisions. For example, if an online service provider’s designated agent changes, the service provider must make sure that the agent registration information is updated not only with the Copyright Office, but also in all places on the service provider’s website where the designated agent is identified. Online service providers can amend their registrations at any time for an additional $6 per submission. Additionally, the Copyright Offices requires online service providers to renew their agent designation at least every 3 years. To do this, service providers must resubmit their registration before it expires, either with the same information if still accurate or with any updated information. Renewals are also $6 per submission. Any amendment filed will begin a new 3-year period before a renewal is due. As most internet users of today know, music, videos, poems, photographs, and various other creative works are often posted on social media and other sites without the permission of the work’s creator. These postings violate the creator’s exclusive right to distribute his or her own work, one of the central rights protected by copyright law and based on the Constitution. To address concerns of increasing copyright infringement online, Congress enacted the Digital Millennium Copyright Act (the “DMCA”) in 1998. The DMCA allows copyright owners to submit takedown notices to internet service providers (who provide the platforms for postings, think YouTube, SoundCloud, Twitter, etc., abbreviated in this article to “ISPs”), demanding that access to an infringed work be blocked or the work removed. In exchange for compliance with the DMCA and the swift removal of infringing materials, ISPs are exempted from liability for copyright infringement. Although the DMCA may have provided a sufficient remedy for copyright holders in 1998, copyright owners in recent years have complained that the increase in infringing posts resulting from the proliferation of user-upload sites such as eBay, SoundCloud, Vimeo, and others makes the takedown process onerous. For example, since 2012 the music recording industry has sent takedown notices for over 17 million infringements. Google receives on average over 75 million URL takedown requests per month, and must use computer programs to sift through them all. In response to the uproar from copyright holders, Congress has requested the Copyright Office conduct a study to determine the effectiveness of the DMCA. The study is currently ongoing, with the Copyright Office receiving more than 92,000 submissions in its first round of comments. In reviewing comments submitted during the first round, battle lines have clearly been drawn between the creators of works and ISPs. In support of its position that the DMCA sufficiently protects the various parties’ interests, in its comment Amazon focused on the economic growth driven by the DMCA’s safe harbor provision, noting that, because of the safe harbor, ISPs have not been required to conduct the “difficult” task of policing posted content, a policy that has been “crucial to the growth of the Internet.” Amazon further asserted that the DMCA strikes “the right balance” between providing rights holders with the ability to remove infringing content while allowing ISPs the ability to “innovate and host ever-increasing amounts and types of content without fear of massive liability based on the activities of their users.” Other ISPs argue that, in fact, the takedown system is being abused, with a “guilty until proven innocent” approach often leading to misuse and overreach. One Google-backed study, conducted by the Berkeley School of Law, found that almost 30 percent of takedown requests received in a six month period had validity issues. Creators of copyrighted works, however, assert that the take down provisions are not an adequate deterrent to infringement,  particularly when a majority of takedown notices are for infringing uses previously the target of a notice. To counteract the cycle of takedown-repost-takedown, many creators are arguing for a “takedown, stay down” provision, which would allow copyright holders to submit a takedown notice for a work once with the expectation that the work never appear again on the same platform. Indeed, in support of its position that the DMCA needs strengthening, the Artists Rights Society argues that the current takedown provisions, contrary to Congressional intent, favor ISPs, who profit from infringing posts through listing fees, advertising, and/or increased traffic. To restore balance, the Artists Rights Society recommends that online service providers be required to pay a percentage of the quantifiable revenues received from an infringing third-party user to the copyright owner. The Artists Rights Society does not elaborate on how these fees would be collected and dispersed. Taking a slightly different course from both their fellow creators and the ISPs, the American Photographic Artists (“APA”) propose turning the tables on the oft-anonymous infringers who are benefitting from, according to the APA, a “de facto immunity” under the DMCA. This de facto immunity is the product of the high cost of pursing a copyright infringement claim and the potentially low damages return (particularly for unregistered works), making the pursuit of infringers essentially pointless. Although it does not appear from its comment that the APA is advocating for one particular measure to shift the risk of infringement, one possibility the APA discusses is requiring an infringer to reimburse the copyright holder’s costs spent on a takedown. 17 U.S.C. § 106; U.S. Const. art. I § 8 cl. 8. Many would argue the DMCA never worked well and was instead poorly thought out and poorly executed. See Chris Mills, These Three Dumb Examples Prove that Copyright Is Broken, BGR (May 24, 2016), http://bgr.com/2016/05/24/dmca-abuse-copyright-issues/. Randolph J. May & Seth L. Cooper, Copyright ‘Notice and Takedown’ System Needs Fixing (May 9, 2016) http://thehill.com/blogs/pundits-blog/technology/279179-copyright-notice-and-takedown-system-needs-fixing. Google, Transparency Report, https://www.google.com/transparencyreport/removals/copyright/. Requests sent to Google are to remove links from Google’s search results due to infringing content on the website, not to remove the allegedly infringing content from the site itself. See United States Copyright Office, Section 512 Study, http://www.copyright.gov/policy/section512/. See United States Copryight Office, Requests for Public Comments: Digital Millennium Copyright Act Safe Harbor Provisions, https://www.regulations.gov/#!docketBrowser;rpp=25;so=ASC;sb=title;po=0;dct=PS;D=COLC-2015-0013;refD=COLC-2015-0013-0002. Amazon.com, Inc., Section 512 Study: Notice Docket No. USCO-2015-7 and Request for Public Comment, p. 3. Caroline Craig, DMCA ‘Reform’ Harbors Return of SOPA, InfoWorld (May 20, 2016), http://www.infoworld.com/article/3072456/internet/dmca-reform-bill-harbors-return-of-sopa.html. Id. ; Jennifer M. Urban, Joe Karaganis, & Brianna L. Shofield, Notice and Takedown In Everyday Practice, 11 (2016), available at http://poseidon01.ssrn.com/delivery.php?ID=847004104083015079003097000087118126055092036006058054127082102102096125010084120011039049035031006028001088081018024096080127018007025078012087102086098102098094112018040048025114126122121121117028006069023030065090123077101074065106086070087025106064&EXT=pdf. See American Photographic Artists, Inc., Initial Response to Notice of Inquiry 78 F.R. 13094 (Docket No 2015-7) Section 512 Study: Notice and Request For Public Comment, p. 2. In fact, the Federation of the Phonographic Industry has reported that 94% of its takedown notices are for “recordings uploaded repeatedly” to sites already notified of the infringing posting. Randolph J. May & Seth L. Cooper, Copyright ‘Notice and Takedown’ System Needs Fixing, The Hill (May 9, 2016), http://thehill.com/blogs/pundits-blog/technology/279179-copyright-notice-and-takedown-system-needs-fixing. TorrentFreak, Ten Websites Hit With 70M DMCA Complaints In A Year, TorrentFreak (May 29, 2016), https://torrentfreak.com/ten-websites-hit-with-70m-dmca-complaints-in-a-year-160529/. See Artists Rights Society, Comments of Artists Rights Society, p. 2. See American Photographic Artists, Inc., Initial Response to Notice of Inquiry 78 F.R. 13094 (Docket No 2015-7) Section 512 Study: Notice and Request For Public Comment, p. 3.